Dr. Miklós Lévay was elected Judge of the Constitutional Court by Parliament in March 2007. He entered into office on 21st April 2007. 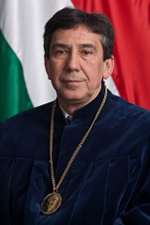 After graduating from the Faculty of Law and Political Sciences of Eötvös Loránd University in 1980, he started his career as prosecution drafter at the Public Prosecutor’s Office in Budapest. In 1984 he qualified as a judge-prosecutor. From August 1981 to June 2004 he worked as a full-time lecturer, between 1992 and 2000 as vice-dean, from 2000 to 2004 as dean at the Faculty of Law of the University of Miskolc. From 1995 to June 2006 he was director of the Scientific Institution in Criminology at the Faculty of Law of the University of Miskolc. Between 2001 and 2004 he worked as a partial time university professor at the Scientific Institution in Criminology at the Faculty of Law and Political Sciences of the Pázmány Péter Catholic University. Since February 2004 he has been working at the Faculty of Law and Political Sciences of Eötvös Loránd University. Since October 2004 he has been Head of Department of Criminology. Between 1st July 2006 and 31 March 2007 he was the General Vice Rector of Eötvös Loránd University. He obtained his candidate’s degree in 1992, and he qualified as a university lecturer in 1998. He carried out researches in abroad on several occasions, inter alia: at the University of Pennsylvania in the USA, at the Rutgers University in the USA, at Université Catholique de Louvain Faculté de Droit, Département de Criminologie et de Droit Pénal in Belgium and in Freiburg, Germany at Max-Planck Institute. Since 2011, has been responsible for Criminology MA Program at Faculty of Law and Political Sciences of Eötvös Loránd University. His main fields of research are: criminological and penal aspects of the drug problem, drug policy, constitutional law and penal law aspects of the declaration of acts as crimes, effects of the social changes on the delinquency and the criminal policy, juvenile delinquency and penal law of juvenile delinquents, rights of children. He is a member of the Directory Board of the Hungarian Society of Criminology and he is member of the Scientific Board of National Institute of Criminology. In 2009, the European Society of Criminology (ESC) elected him as the president of ESC. He is member of the Board of Directors of International Society for Criminology (ISC). In 2013, he was appointed by the Secretary General of the United Nations as the chairman of the Advisory Board of the European Institute for Crime Prevention and Control, affiliated with the United Nations (HEUNI).